I’ve officially started the process of a lot of my packing. This includes packing away my Hauppage and my games. 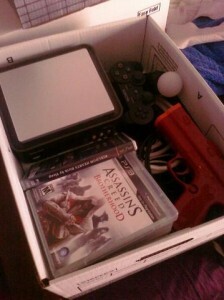 –though I won’t be packing away my PS3 (it’s a bit big. I’ll have to transport it on its own, really) for some games (Wipeout HD and Netflix). I won’t be streaming for awhile, though. My PS3 (and one controller) is the only gaming system out, with the exception of handheld systems, of course. Most of my cables and extra stuff have been packed away, and my games are put up. I can’t gauge how much I’m packed, namely because I’m the only one moving from this townhome. It’s a little strange for me, really.